One of the pleasures of moving to New England, after 16 years in California, was learning more about our country’s history, and in particular, our literary history. I toured the Orchard House (where Little Women was written, and where Louisa M. Alcott lived with her parents and sisters). I breathed in the literary dust of Emerson while touring his home, just across the street from Louisa’s. Daily walks from my own home led me pass the Old Manse, where Thoreau and Hawthorne, Fuller, Alcott and Emerson, laid plans for a garden, and a better world. 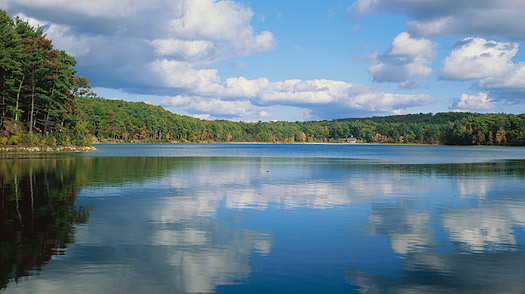 But I was most affected by my strolls around Walden Pond, just a few miles away, and the stomping grounds of Henry David Thoreau. Every time I took my guests for a hike around the “pond” (much more like a lake) and then meandered around the cabin replica and gift shop, I’d pick up a book on Thoreau’s writings or a book mark with one of his quotes. You know, Thoreau had a lot to say. Statue of Henry David with cabin. Don’t we all know the value of this thought, deep inside? The more ‘stuff’ we surround ourselves with, the more our heads get stuffed with non-necessities. The more we add to our lives (items, not friends), the more we lose sight of who we really are, deep down inside. My man and I took Thoreau seriously. First, we named our new puppy, Henry (Henry David when he got in trouble). And then we really got serious. We left our beautiful, much-loved 5-bedroom home, and downsized to a 2-bedroom condo. To make the move, and the change, we had to get rid of a lot of “stuff.” All of my beloved books – off to the library and the thrift shops. Lamps, couches, extra rugs and dinnerware – sold. Oak headboards, mattresses, linens and towels – gone. Antique dressers, hope chests, and piano – offered to family and friends. I never cried for any of it, and to be truthful, never missed it either. 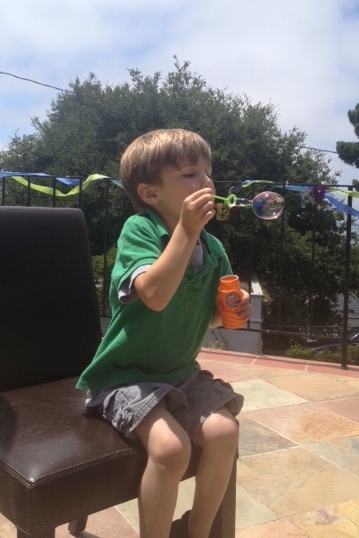 The need for those things seemed to blow away, like tiny bubbles in the wind. I discovered that Thoreau knew it all, back in the mid-19th century. The less we’re encumbered with possessions, the more open we are to the world around (and inside) us. That said, I’m going to simplify a bit further for the next two weeks and not write. Gasp! Well, no, I’ll write, but I won’t share my flashes of writerly wisdom while I’m frolicking with grandchildren, swimming in the Atlantic Ocean, avoiding the East Coast jellyfish, and all around playing. I hope your next few weeks are simply – joyous! I’m going to practice my jumps in the water like that during my blog-time-off! Enjoy your vacay! Lemme know if you visit New Jersey. S. Jersey Shore! Meet you at 55th and Ocean?? Of course, the motto is easier than the actions sometimes, but I keep trying! but how do we do it in this complecated world. enjoy your time away. It’s definitely a challenge in this day and age. Thanks for stopping by Bob! guess who forecast 1927 is. it’s Bob Krueger! What a wonderful place to live! And thanks for the reminder to Simplify. Never loses its power. It’s an easy concept, but hard to accomplish. Speaking of which, I think I’ll add some just-read books to my ‘don’t need’ bag and drop it off at the Thrift Shop. So much easier in theory than in practice! When we moved from our big PA home to our small NJ house, our word was “ruthless!” Unless we were absolutely attached to it and it was useful, we sold it! 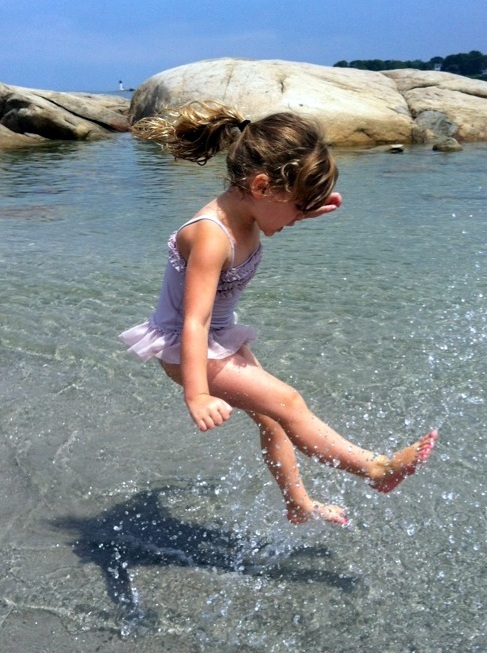 We still moved with more than we needed….love the frolicking granddaughter pic! Have a fun vacation! Ruthless – perfect word. Because we need some grit behind our actions when downsizing; otherwise, it doesn’t get done. How neat that you’re reading Walden! 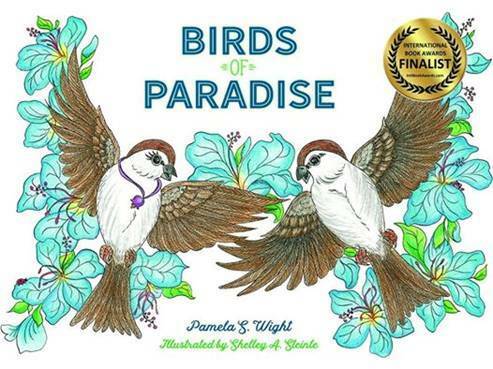 Everyone should read this book several times in their lives, don’t you think? You’re right, we have to find a balance between our idea of simple bliss, and another’s. At least we ALL enjoying frolicking in the sea. A simple pleasure. I’m working on simplifying too. Seems the older I get, the less stuff I need to clutter up my life. Henry certainly knew what he was talking about! Enjoy your time with your lovely grandchildren! You know, I think you hit the nail on the head. As we get older, we realize we don’t need the ‘stuff’ as much. In fact, the clutter begins to bother us. Interesting. Oh, in my youth and first few decades, I collected so much unnecessary stuff. Moving state-to-state a couple of times cured me of that. And then there was that pesky flood that nearly wiped me out – that’s not a good way to clean out the junk, but it sure is definite. I did manage to save my family photos, books, notes, files. But the furniture and all the other clutter…I found I didn’t really need any of it. Wish I could have saved the Phillies jersey, but oh well. I certainly agree…simplify! Though I’ve never read Thoreau he was certainly a remarkable guy. People would most certainly be happier living by his principles. Like you Pam I moved once, leaving half my stuff behind ‘to collect later’. Guess what? Have a great break. HaHa. Yes, if you leave the ‘stuff’ behind, you find you don’t need it, huh? If you don’t want to read all of Thoreau’s works (and I don’t blame you, he uses the mid 18th century vernacular), just read his quotes. They will keep you thinking for a long time. 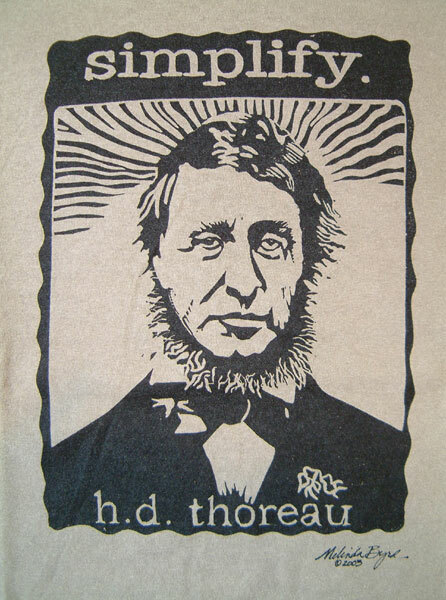 I like that you like Thoreau. I like your picture of frolicking. I like the idea of simplifying. (Hey, do you get the idea that I like this post?) Enjoy your time off! Thanks for liking! From your great blog posts, I feel that you work on ‘simplifying’ your life on a daily basis, in wonderful ways. Oh, I’d love to take this literary history journey. Enjoy your break. 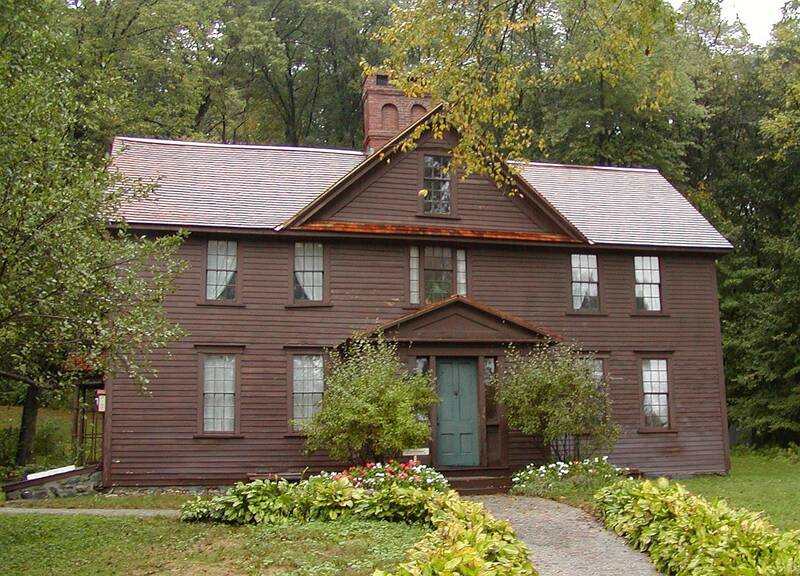 It’s amazing how much literary history is in just one small town in New England – Concord, MA. 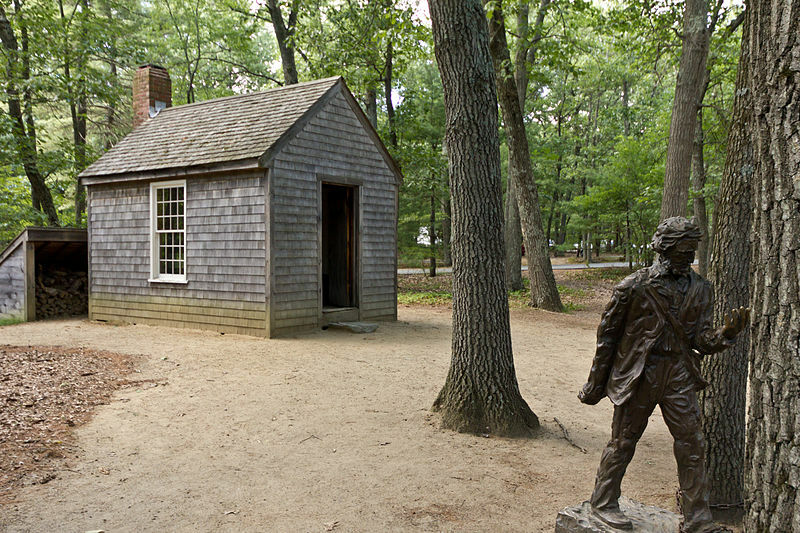 You can spend days not only visiting Hawthorne and Alcott’s homes, but the Old Manse, Walden Pond, and then on to the American Revolution, with the Minuteman statue and park and paths (where we heard the ‘shot heard round the world’). Historically inspiring. Thoreau’s quote really spoke to me. About two years ago, my husband and i left on a (semi) ’round the world adventure, and returned with very different perspectives upon ‘stuff’ and the importance of leading a more simplistic life. Yes, I’ve heard of that from friends who have traveled on safaris, for instance, to South Africa, where they also visit the small villages. When they return, they complain of culture shock. So much ‘STUFF back here’ they say, ‘it’s overwhelming!’ Unfortunately it doesn’t take long to get back into our overindulgences. Good for you. And I can tell you after having worked many days clearing out our parents’ house following their death—the things are eventually left behind and become meaningless anyway, at least most of them. I’m hoping to start working my way down and out of possessions, but from where I’m sitting, it will be a long journey. I agree. That’s one message I got loud and clear.